Before we even landed in St. Louis a few months ago, friends and family were already recommending we go to Pappy's Smokehouse to have a taste of St. Louis barbecue. So we were not surprised when the locals also gave their head-nodding approval by saying: "Have you been to Pappy's?" when I ask them where to go to taste something "local". Since we are now STL residents and have a lot of restaurants to try, I thought that going to Pappy's will remain in our bucket list for awhile. But to my regret, we should have gone there first because this is the place to be in St. Louis for barbecue. 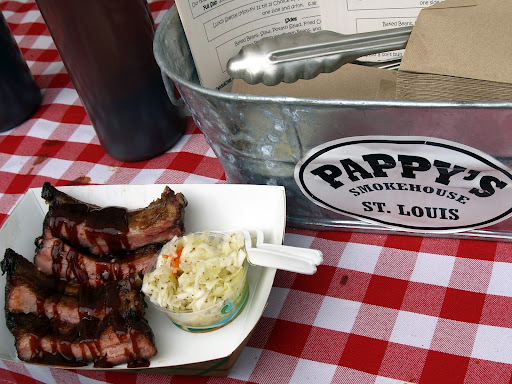 So come on in, it's time to talk about All Good Things St. Louis and today I'm taking you to Pappy's Smokehouse. Now don't ask me how many times we've been here. Since it's located a block away from my husband's work, the smokey goodness beckons us all the time. Every chance the slow sear scent of barbecue from their pit sneaks into our car, my husband and I stare at each other, and voila, off to Pappy's we go. Word of caution though, just go there early, especially on weekends, because the lines get pretty long. But it's still worth the wait. 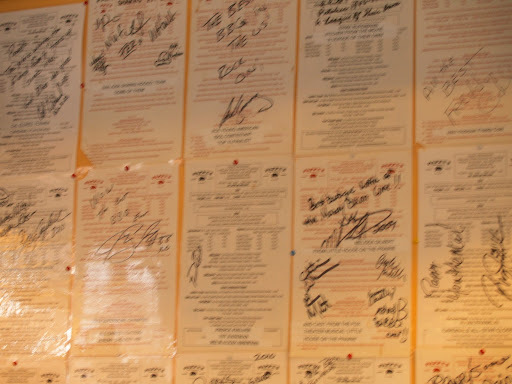 Their walls speak for themselves, as it were lined with framed certificates of approval of food aficionados. 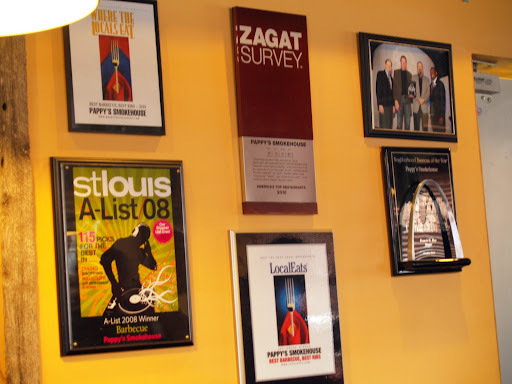 With no less than Zagat voting them as one of the Top 10 Barbecue Meccas in August 2011. They were also voted one of the 101 Best Places To Chow Down in America by The Travel Channel. Who would doubt that they are the best in town? The ambience is unpretentious... very homey and casual. It is sure a down home barbecue joint. No frills, just a few memorabilia and a few merchandise. As I've said it's a straightforward hole in the wall, and you know you are there for the barbecue. What are those spices doing up there? I told you, it's a no frills barbecue joint. So beats me why it's up there. While the lines are long, they move quickly. And you will be delighted to know that the staff are outright friendly and courteous. When I told them that it was our first time, the waiter gave me a free sample that he sneaked out from the kitchen. 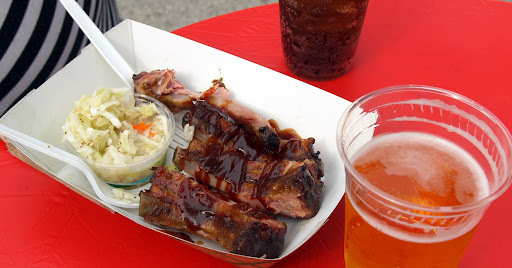 I was nibbling a piping hot rib fresh from the smoke oven and of course that set my excitement higher to grab the half slab of ribs for my fingers to dig in to. The ribs are sensational! They are fall off the bone tender. You know that it is a result of hours of "labor of love" as the owner Mike claims it to be. He said that St. Louis Barbecue is different not in the technique of cooking it but it's all in the butcher cut. It's baby back ribs that's cut shorter but has more meat. I should haven't put the sauce on it since the ribs itself is so juicy, sweet and tangy. There was no need for the sauce actually. The coles slaw is so acidic-ly addicting. It's something like your grandmother's homemade pickles. It's tangy with a subtle sweetness at the end. 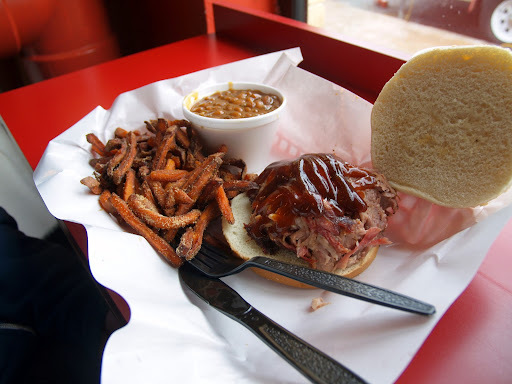 Not to be outdone is their soft and tender pulled pork sandwich. You know it was slow roasted pulled-pork deliciously layered in a bun. You have different options for sides and I picked sweet potato fries and baked beans for a change. I didn't regret the choice as the fries were golden brown to perfection and sprinkled with sugar and spices that are definitely finger licking good. Now that I'm a local STL resident, I highly recommend Pappy's. 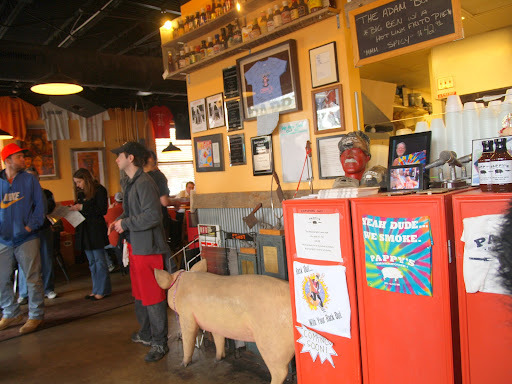 And it's my turn to say to new STL transplants, "Have you been to Pappy's yet?". Because for sure, you'll love me for recommending this place to you. It's one of those moments when you could feel your head lifting your chin up, and your cheeks slowly stiffing up until you smile, because you know you are in barbecue heaven. I'm glad to "meet" another blogger from STL. Being a new transplant, I'm always thrilled to "meet" new friends. I hope to see you around.